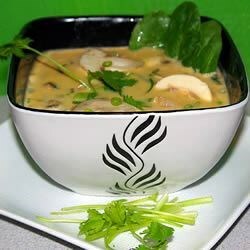 "This delicious Thai-style soup has coconut milk, shrimp, mushrooms, and spinach. Chicken may be substituted for the shrimp; either way, I love this soup anytime!" Bring a large pot of lightly salted water to a boil. Add rice noodles and cook until al dente, about 3 minutes. Drain and rinse well with cold water to stop the cooking; set aside. Heat oil in a large saucepan over medium heat. Stir in garlic, lemon grass, and ginger; cook and stir until aromatic, 30 to 60 seconds. Add the curry paste, and cook 30 seconds more. Pour in about 1/2 cup of the chicken broth, and stir until the curry paste has dissolved, then pour in the remaining chicken stock along with the soy sauce and sugar. Bring to a boil, then reduce heat to medium-low, partially cover, and simmer 20 minutes. Stir in coconut milk, shrimp, mushrooms, spinach, lime juice, and cilantro. Increase heat to medium-high, and simmer until the shrimp turn pink and are no longer translucent, about 5 minutes. To serve, place some rice noodles into each serving bowl and ladle soup on top of them. Garnish each bowl with a sprinkle of sliced green onion. A delicious, must-have soup recipe. I added wedges of red onion and tomato. I left out the cilantro. I wanted it to taste like the thai curry soup at noodles and company. I think I succeeded. I followed the recipe exactly and this soup was excellent! the only thing I would change would be to add more mushrooms. Very yummy! I omitted mushrooms, and instead put red bell pepper strips in it. Also less curry paste - it was still hot!